During World War 2 the White Motor Company produced many trucks for military use. The White 666 was built to specific military standard and served through World War 2 and on. 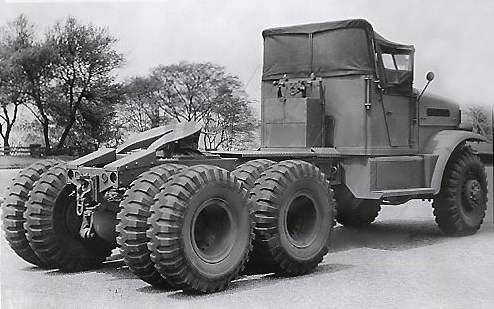 This early 6x6 truck was built with a full metal cab, but later models featured a soft top, and this is the subject of the latest kit from Hobby Boss. My first impression when opening this new kit from Hobby Boss was wow. First glances looked to be an impressive kit, and I was proven right. The kit is molded in a tan colored plastic, and the molding is done very well. There is very little to no flash found, no sink marks, and only a few ejector marks. Of the ejector marks, most will be hidden in construction other than on the bottom of the truck bed, but a little filler and sanding will fix that. Also Hobby Boss has done a nice job of packing the kit as some of the fine delicate parts are protected with thin foam. In terms of detail, there are some small and fine molded parts included on the sprues, so care will be needed to remove those parts. The kit includes a sprue of clear plastic for the windshield and head lights, again well molded with no bubbles found. A fret of photo-etched detail is included that will add some extra fine detail and non-slip pattern to the running boards. There is also a small length of chain and a length of string for adding more detail, including the winch. Assembly of the kit begins with the frame, which is a multi-part affair, but it should not be an issue keeping it square as there is a large piece representing the bottom of the engine and transmission. The kit does not include a full engine and transmission. However, it does include some nice detail underneath with air tanks, a nice looking suspension, transfer case, and axles. There is no piping for the air system, but for those who want a little more detail, a little wire should be able to add this in short order. With the frame completed, the next component will be the well detailed winch, which includes separate string to add for the winch cable. At the bottom of the winch assembly is the transfer case; this will need to be installed prior to adding the drive shafts and axles. Care will be needed during this stage, as there is a lot of fine parts and rods, and also note the “no glue” parts. For tires, Hobby Boss has included poly-molded rubber like tires. While the tread pattern looks ok, there are no sidewall markings and there is a seam that runs the circumference of the tire that will need to be shaved off. In my opinion, sourcing aftermarket resin tires should improve the look of the completed kit. Once the lower chassis is complete, assembly of the cargo bed and cab starts. The molding of the cargo bed looks to be well done with molded wood grain details. The assembly looks to be straightforward and should not cause any issues. The cab assembly starts with the cab floor by adding seats, shifters, steering column, and other detail parts. This is then added to the fully molded cab and front hood. This is a solid piece, and since there is no engine there is no reason to perform surgery to show the non-existent motor. There are decals included to complete the cab’s instrument panel. The soft top is a single molded piece with good looking molded creases. If the modeller would like to leave this off, they would have to scratch build the frame. I did find that the front grill looks to be a little thick, but with some tedious sanding, one should be able to bring it down to a more scaled look. With the cab and cargo bed complete, all that is left to do is join the sub-assemblies to complete your White 666 cargo truck. The kit does include a painting and marking guide for one unidentified vehicle. The decals look to be printed very well and within register. The instructions are laid out over a 12-page booklet with 12 steps. While some of the steps are a little busy, the instructions do seem to be well done; I would advise that you review each step carefully before starting. The White 666 Soft Top kit from Hobby Boss looks to be a well molded and detailed kit. Overall the kit looks to have a great detail chassis, and the inclusion of photo-etched parts should produce a great looking built model. The only real issues are the lack of the engine and the poly rubber tires. I would recommend this kit for fans of military cargo trucks. Highs: Well molded, great looking detail, interesting subject. Lows: No engine, quality of the poly molded tires a little weak. Verdict: This should build into a great model, highly recommended. Food for thought but how about a fifth well version of the White? Started my 666 just today, beautifully engineered kit, GREAT fit! Quoted Text: - Just a thought - - You might want to add some wedge shaped "run up ramps" behind the fifth wheel to protect the frame and the fifth wheel when backing in under a parked or loaded trailer. This is usually SOP on a semi-tractor especially on such a long wheel base vehicle where the fifth wheel ends up so far from the rear end of the vehicle frame. End Quote _________________________________________________________________________ White Motors Corporation/US Army photo I admit the photo above is of a factory production semi-tractor rather than a post-war conversion but it looks like on this one they have removed the bumperettes and also shortened the frame back 8 inches to the tow hitch cross brace. And of course added the trailer run up ramps. - If you get in a situation where you are trying to hitch to a trailer that is sitting low for some reason; as in it has sunken into soft ground or is sitting facing down hill or it is already heavily loaded, you are going to need those run up ramps. p.s. I don't know if I can stand to leave the winch off though! The Dragon Wagon fifth wheel MIGHT be OK for the White truck but is way too large for use on the GMC Deuce or for the Studebaker. In the photo above the fifth wheel appears smaller than that used on the Dragon Wagon. Also the DW had an extra heavy duty, oversized fifth wheel that accepted only an oversized hitch pin to handle the heavier loading. After a brief internet search it appears that the standard of the industry for normal commercial use is a fifth wheel that accepts a 2 inch king pin. Heavy Duty applications call for a larger 3.5 inch fifth wheel/king pin combination. Do they go even larger than 3.5 inches? I suspect yes but cannot find any reference at this time. I also found a reference in the book "The American Arsenal" that some medium weight military trailers had a "flip over", convertible king pin that allowed them to work with both the 2" or 3.5" fifth wheels. Thanks, Kevin, for the review. I'm disappointed there is no top for the cargo compartment, but presumably the AM resin guys will remedy that. Another reference photo recently found online. I think the trailer is going to bottom out before the driver ever get the load up that small hill. Hope that is just loose sand. If so then he may not get stuck. Wish I could see the next photo taken a few minutes later. I vote that the trailer will lift the rear wheels of the tractor off the ground and the rig won't be going anywhere anytime soom.